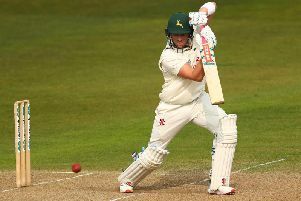 Harry Gurney said he and his Notts Outlaws team-mates are hoping to repay the Trent Bridge supporters’ faith when rivals Leicestershire Foxes visit on Friday night. The Outlaws have had a mixed bag of results so far this year in the Vitality T20 Blast, winning three and losing both home matches in the North Group to Birmingham Bears and Durham Jets. But Gurney and his fellow Outlaws are hoping to give the Trent Bridge crowd a win to cheer about when the Foxes come to town. “After losing the first game in front of a great crowd - and we had a fantastic crowd in tonight on a Tuesday night, we were really keen to put in a decent performance for them, so we’re really frustrated we weren’t able to,” said Gurney, following the 34-run defeat to Durham. Durham’s success was largely helped by an unbeaten 98 from skipper Tom Latham as the visitors posted 184-5.